Standard posters are either 11”x 17” or 12”x 18” and can be printed on a variety of papers. Our 12pt. coated, two sided paper is thick and durable and makes a very nice presentation. Short run or long run is available. 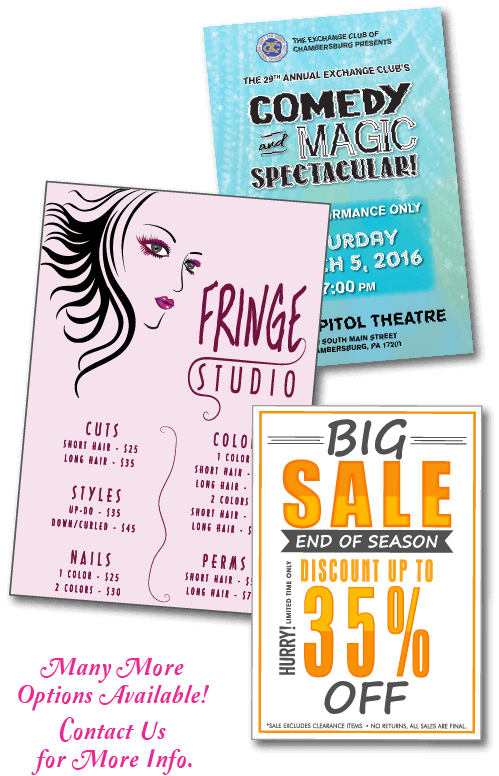 Larger sizes are available with our wide format printing. Larger posters or prints can be output on our wide format printer. We offer a heavy weight semi gloss photo paper up to a 36” width by a 100’ foot length, so the possibilities are endless. We can also mount your print onto foamboard or laminate it so it is more durable.